London Design Festival 2013: Amsterdam designer Roel Huisman has created a desk with an ash lamp and glass vase embedded in a thick slab of resin. Writing Table by Roel Huisman is the first in a new series of polyester resin tables by the designer. It features ash legs, an aqua-coloured resin table top, an inset glass vase, a desk lamp and a small storage compartment that is concealed by a sliding ash writing surface. Huisman added coloured pigment to a transparent polyster resin to achieve the desired pastel tone. The material was then cast, milled, sanded and polished. "I like to combine the polyester with wood, a natural combination since the resin was developed for the naval industry," said the designer. 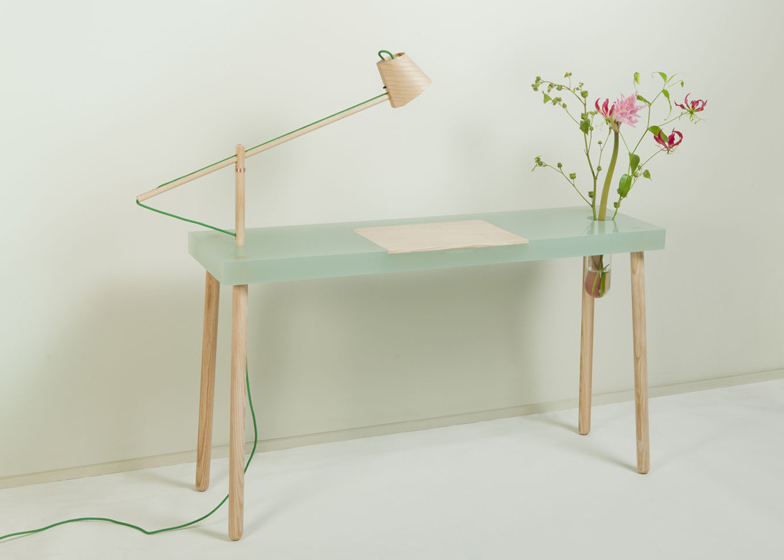 Two ash poles make up a pivoting desk lamp, which is connected to a power source by a bright green cable. Writing Table is a continuation of Huisman's wall-mounted resin shelves. This table is on display at the Cabinets of Curiosity showcase at Mint Shop, 2 North Terrace, Alexander Square, SW3 2BA until 22 September as part of the London Design Festival. Photographs are courtesy of the designer. The experiences I have had in designing for theatre performances and living in an interior I designed myself have made me become more and more interested in the interaction between the objects that I design and it’s users. The pieces I design are meant to easily blend into your interior to form a pleasant everyday encounter. This writing table is the first of a series of tables in polyester resin and a continuation of the Shelves series. Polyester resin is used for its amiable appearance. The resin that is used has a base that is transparent and non-coloured. With pigments we achieve the desired colour and opaque quality. The piece undergoes a series of steps in which it is casted, milled, sanded and polished. I like to combine the polyester with wood, a natural combination since the resin was developed for the naval industry. I use ash-wood to accessorise the tabletop with several functional elements; a lamp, a vase and a small storage compartment to become an object you will enjoy for it’s humble aesthetics and elegant functionality.